The doctor’s appointment was scheduled for Tuesday , October 14th, 2014 at 10:30 a.m, 5 days before the much anticipated marathon. With the ankle still hurting, and not healing fast enough for my liking, after much poking, twisting and squeezing from the doctor, it came as no surprise when the doctor announced with apology, that the ankle was not quite ready to run a full marathon on Sunday. I had already come to terms with this injury. My training partners, my team, my friends have all been so extremely supportive. Yes, there would be many more races to come, and I would be back, much stronger than ever. Despite the fact that I was out of the running, the race still goes on. The needs of my charity, Dekpor School are still there. As in any country, education is the key that will break the cycle of poverty. It is no different in Ghana, Africa. My wonderful co-workers in the warehouse at my place of employment at Busch Systems, had a money jar for loose change set up, to help in my fundraising efforts. When I mentioned I may not be running, they mentioned it did not matter. They still gave graciously and generously. I have really grown to love all my training partners so much. Strange as it may sound to the non-runner, but Wednesday afternoons were extremely anticipated, when we would get out and go running rain or shine, anywhere from 12 to 18 kilometers. 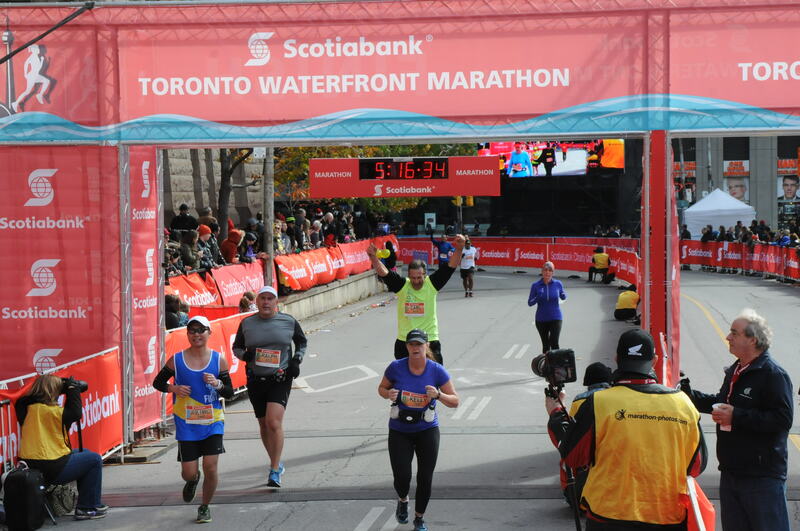 Despite not planning to run on marathon day, my intent was to go to Toronto and “RUN FROM THE SIDELINES” and cheer on, and support my team, and my training partners any way I could. Arriving at a hotel lobby with my daughter, it was easy to spot my team with our bright green jerseys. 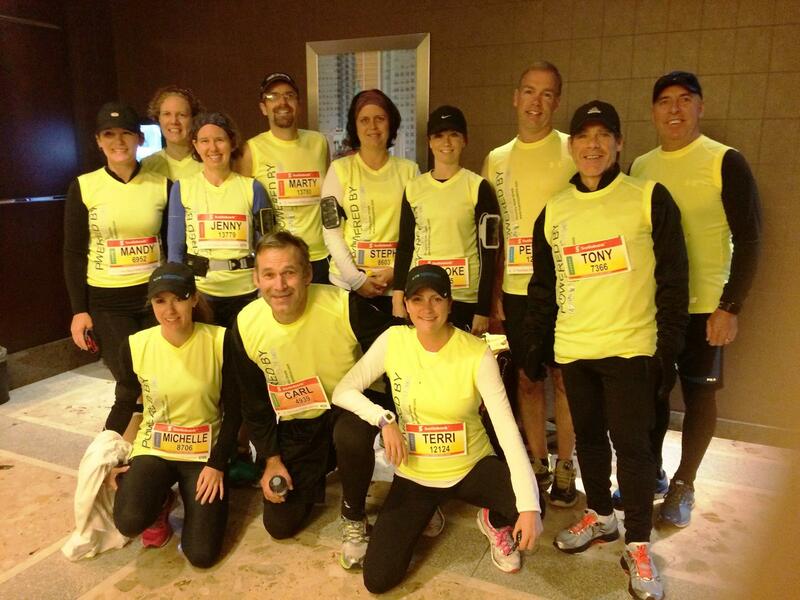 I had also arrived in my own full running gear, simply to feel part of the team, when our group photo was taken. 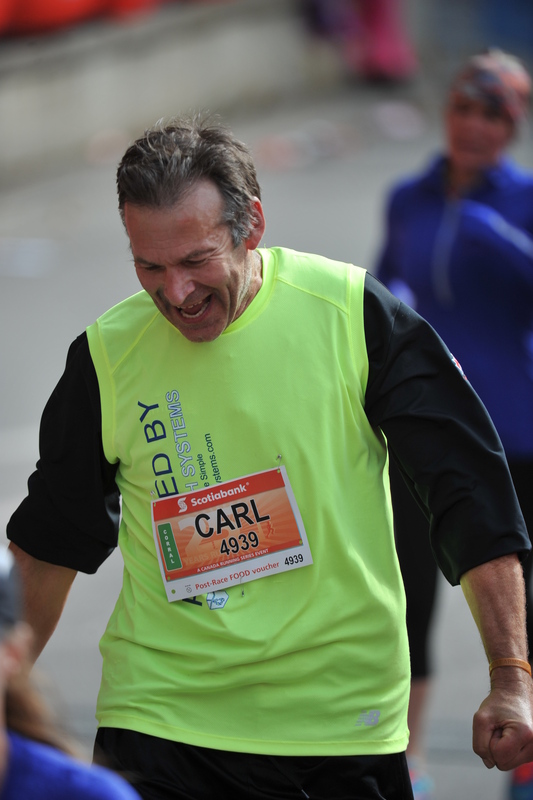 When Marty, the manager of the company where I work, and organizer for all our runs, saw me in my running gear, he looked quite puzzled and asked, “Are you planning on running Carl?” Out of nowhere, my answer was “YES”. There was a shocked look on Marty’s face, I am sure the look on my face was just as shocked. “Where did that come from???? ?” Before I could take back my answer, it seemed that everyone within earshot, had spread the news to all the others within seconds. “Hey guys, Carl is going to run”. The day before, I came away from a funeral and burial of a young 20 year old man named Justin Scott. He was the 1st child for a very dear couple my wife and I have known for the past 25 years. He was the 1st grandson of Godparents my wife and I specifically chose to care and raise our children, if the 2 of us were to pass away. Born just 28 days apart from my own son, Justin was SO similar to my own son in EVERY way. As a keen Christian, he lived his faith, always giving, always reaching out , always helping others. So much so, that many, many people wanted to lay claim that Justin was THEIR son and part of THEIR family. This could so easily have been my own son killed in the motor vehicle accident. My heart was absolutely breaking for the mom and dad. It was shaking my foundations to the core. With this funeral and burial SO fresh on my heart, my concerned teammates were milling around me asking a lot of questions, one of them being, “Carl, are you still going to try the full marathon?”. Bursting into tears, I answered, “I don’t know, I honestly don’t know, but PLEASE, I REALLY NEED TO TRY”. Without trying to talk me out of it, Marty called out to Tony (a teammate who had my bib in his room), “Tony, go fetch Carl’s bib”. While there was a blur of conversation and activity all around me, I spent all my concentration on my ankle brace, trying to get it tight enough for stability and support, but loose enough for the anticipated swelling that surely I would be facing. After several adjustments and walks around, I was happy. When the running bib arrived, I was shaking so uncontrollably with emotion, I could not pin it on, and my daughter Naomi ended up pinning it on for me. We gathered for our group team photo, after there were hugs all around, with Marty being the last one, saying, “Carl, please promise me you will be very careful.” I answered, “Yes, I promise.” It was the strangest feeling walking out to my corral. I had absolutely NO idea what lay before me. No “carbing” up the day before, very little sleep, and even feeling very dehydrated at the start. But the biggest item was this ankle. Although there was MUCH less pain and swelling from 5 days earlier at the doctors, it was untested. I hadn’t run in 19 days, and the most I had walked in that period was just over a kilometer. Would it last 5 kilometers, would it last 10 kilometers? I had absolutely NO idea. The start was very awkward. I tried the technique I used during last year’s half marathon with my knee injury, of a fast walk/run while barely lifting the foot, but with the ankle brace, it was so very uncomfortable. Settled for just a light run, similar to what I have trained all year, but a bit slower. People were running past me, but that was okay. What an incredible feeling it was to be running in this marathon. At around the 8 kilometer mark, I heard “CARL!”. It was Ann, one of my training partners, who had been training extremely hard for her 1st half marathon. In the 10 weeks she has been training, she has become a “machine”, powerful and fast. Starting in the “purple corral”, with the amount of runners present, she would have literally passed several hundred runners just to get to where I was. Knowing perfectly well I was really slowing her down, I tried to encourage her to keep pressing forward. But she was more concerned for me, and that I was doing okay. We ran together for about 8 kilometers, and at about the 16 kilometer mark she mentioned, “I think I will run ahead now”. And within a minute, as she weaved in and out past other runners, she was out of sight. I am so grateful to have such AMAZING, selfless running partners. All along, I still wasn’t sure if I’d do the half-marathon, or carry on for the full. In 3 kilometers I had to decide, where there is a split. At the 19 kilometer mark, the half marathon splits off, and it is 2 kilometers to the finish, while the full marathon continues on, and it is 23 kilometers to the finish. Just completing the “half” would mean a “DTF” (did not finish), but that was okay. The ankle was feeling surprisingly strong, and no worse off from when I started. Had a quick washroom break, and when I got back on the road running, there was Tony, a training partner, and his brother-in-law Pierre. Only 4 months ago, Pierre was in surgery for prostate cancer. 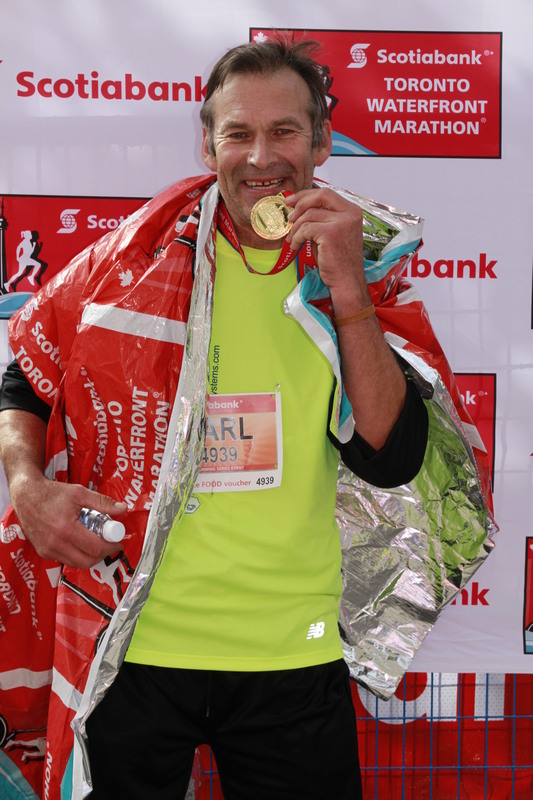 While recovering from his cancer, he only started training for his half marathon in August. Knowing his story, and watching him run so strong and confident, it was at that moment I decided to push on for the full marathon. It was an extremely eerie, strange feeling at the split. After previously having run 2 half marathons, I was now going into uncharted territory. The rest of the team were all running the half marathon. I was the only one running the full marathon. My team members would be finishing all around this time. Many would be completing their 1st half marathon, Michelle, Terri, Brooke, my training partner Ann. I remembered the feeling from my very 1st half marathon a year ago, the joy of accomplishment, the euphoria. While running, I was picturing their smiles, the tears of joy, and wearing that medal so proudly around their necks. It was putting a smile on my face, just thinking about it. My 20k’s became 22k’s, then 24k, then 26k. My pace was very much the same from the start, I kept on forging ahead. Having started my marathon feeling very dehydrated, I was drinking both water and Gatorade at each and every water station. The water stations were becoming much more frequent, as WELL as the medical aid tents. THIS PART was really alarming me. Up to about the 28 kilometer mark, there was the odd runner receiving medical assistance. After that mark, it became a much different story. Runners were dropping out left, right and centre. Every tent had at least 1, sometimes 2 sometimes 3 or more runners receiving assistance. They now spaced either 2, and sometimes 1 kilometers apart. Many runners were off to the side trying to stretch out cramped legs. Many others were walking with major limps. Medical personnel were constantly within sight, riding their bicycles on patrol. It was like a “runner’s apocalypse”, and I was becoming very frightened. Probably the lowest part of the run. Physically, I was strong, but mentally, I was a “mess”. I was becoming so unnerved by what was happening all around me, I texted Marty at the 30 kilometer mark, to let him know where I was. I wrote “thirty k done”. He texted back, “We are all so proud of you. Where are you?’ I read his text a bit puzzled. I read it again, and again and again. “What does he mean?” Then it dawned on me, “He thinks I’m finished!” I texted back “Marty, NO, I’m still running, 11 k to go”. Marty’s reply when he realized I was still running, “Go Carl go”. One last text from me, “Thanks (and a happy face) 🙂 ). I put the happy face to let Marty know I was doing well. Physically I was doing VERY well. The ankle was holding up nicely, and my energy levels were holding up well. But mentally, I had become a “basket case”, so frightened that the my next step would land wrong, twist the ankle, and I WOULD be finished. In the end that texting time was what I needed. I am notoriously slow at texting, and trying to get them done and sent, it took my mind off of what was happening all around me. I also ended up walking while I was texting. Wanted to keep my promise to Marty, that I would be very careful. For those 3 text messages that I sent, it took a while, and I ended up walking for nearly a kilometer. But in the end, it settled me down for the remainder of my run. Me and my “Smartphone”…lol. Letting Marty know I was “okay”…well “sort of” 🙂 Have appreciated Marty’s support through my marathon journey SO much! The mind can either make or break a run. I was alone in this “no man’s land”. In my last long run 3 weeks ago, I had to overcome the disappointment of a trail that abruptly ended, and keep going. Then try and overcome this motorcycle rider’s bluffing, when he came at me at a very high speed. There was none of that here, but I had a much different mental game. Trying to overcome the fear, that my ankle would be re-injured. To fight through it, not give up, but to keep going. My 32 k’s became 34 k’s which became 38k’s. People were still dropping out, others walking with major limps, trying just to make it to the finish. Some were sitting on the curb looking very dejected either through injury, or not being able to break through “a wall”. Others were off to the side violently throwing up. The medical personnel were still very visibly on patrol, and were as busy as ever. At the 38 k mark, there also was a sight I could not believe. It was Batman, his mask and black cape still on. He was walking, and limping badly, labouring of what appeared to be an extremely sore knee. But with only 4 kilometers to go, and being Batman, I KNEW without a doubt, he WOULD make it. My last few steps on that “untested” ankle which carried me the distance. My last hurtle came at around the 40k mark. A runner ahead of me could not physically continue. He was leaning on a medical person to support him. I could hear the medical person on his radio, “Another runner down, just before the 40k sign. Assistance required”. Looking over when I ran by, there was such a look of devastation on the poor runner’s face. Ho was SOOO close, and I felt SOOO terrible for him. It was SUCH a relief to pass that 40k mark. 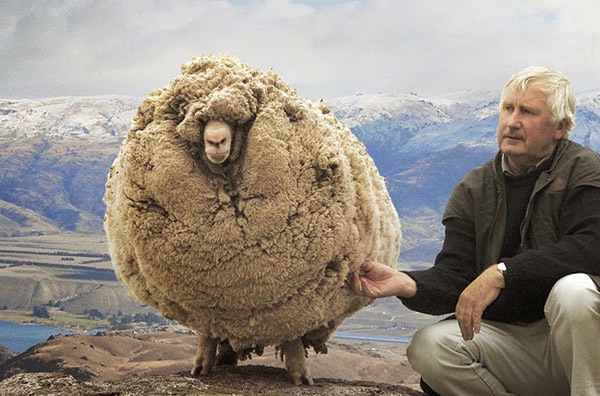 Keep your focus Carl, 2 kilometers to go. Then 1 kilometer, and rounding one last bend, a sign announced 500 metres to go. Today, there would be no final sprint to the finish, no final push. Instead of “RUNNING FROM THE SIDELINES”, I was now “RUNNING FOR THE FINISH”. It was my 1st full marathon, running on an untested ankle that HAD amazingly carried me the distance. And I was savouring, and drinking in EVERY second of those final few hundred metres. SUCH a sense of relief walking away from the finish line. 🙂 This was for you Justin. May you rest in peace. Crossing that finish line was much more a sense of relief, rather than of joy and euphoria. Never have I been so glad to see that line. The time really did not matter, but for the record, my finish time was 4:55:38. Of the 4038 full marathoners who FINISHED, I came in at 3373. Counting the 1443 runners who registered for the full marathon, but DID NOT complete in the 6 hour cut off time, I came in 3373 out of 5481. Thank you being there, because YOU were, every step of the way. Not my medal. This is for ALL you wonderful people that helped me to the finish. THANK YOU! This is such an inspirational story and nail biter (I kept wondering, “will her make it” 🙂 ). This is a great one to read just as I’m about to write about keeping my focus. There will always be challenges and obstacles but we never know what we are capable of until we try. Thank you for such a wonderful read. Thank you so much Sharon for reading, and for commenting (twice) :). Your kind words meant a lot, and I am looking forward to your blog on keeping your focus. Thanks again. This is an amazing story!!!! Congratulations on a job very well done! What an inspiration and wow, the fact you didn’t plan on running until it was about to start…. just WOW!!!! Amazing! Well Done, you made it!! I saw your post on Facebook and have been looking out to read your post about the marathon and was sorely disappointed for you when I read the start (and a little confused), but then you just did it, you completed your marathon. So impressed and inspired, just what I needed to read! I had fallen asleep and woke up as I usually do. I was browsing FB on my smartphone where I have your page liked, and there was this update. I quickly hit it coming on to WP to read. Carl, I cried until the end. Still am at 4 am. Your story and strength and encouragement are a joy to read and take in. I am so proud of you and what you accomplished. Congratulations on your first full marathon! Thank you SO much for your very touching comments. It is extremely humbling that this run has affected so many people such as yourself. Congratulations!! You are an inspiration of grit and determination. Great post, and great effort. I look forward to seeing what you have yet to come in your adventures! Congratulations. That is wonderful. Such an achievement to be proud of. Thank you Suzanne. 🙂 It is still hard to believe that I did it! Great running! It’s always amazing whats in the tank when we dig deep! Thank you so much Natalie, and so true. Did a 7 k, after work today (my 1st run since last Sunday’s marathon), and was thinking “How on earth did I pull that thing off”. It really is that digging deep when we have to, and finding it. So exciting! !! I can’t believe it. This makes me want to go back to running too! Great post dear friend! I am glad I got to be a part of this journey. Like so many others, I am so proud of you and your miraculous achievement. Way to go !!! Looking forward to our next finish line ! Thank you SO much Ann. It really has been wonderful having YOU a part of this marathon journey, both in our training, and your help on race day. Thank you , this is a great example of perseverance! Congratulations!! To paraphrase the Bible, You ran by Faith not by Sight!! You ran your race and finished the course for your godson. What an accomplishment and an achievement! God Bless!! Awww Deborah….Thank You. It really was a run by faith. Your words are full of blessing and encouragement! One of the things that keeps me going during the last stretch of a marathon are the ones running or cheering from the sidelines. The fact that you could join is even better 🙂 Very impressive. This made a really necessary read with the winter setting in! Thank you so much Prajakta for dropping by, and for sharing your kind and encouraging comment. Those running around us and those cheering from the sidelines are such an amazing boost during that final stretch of a marathon. Hoping you have some milder days to enable you to keep running this winter. Saved by the smartphone, perhaps—this is so amazing, that you were able to run the entire Marathon with no expectations (other than whether or not your ankle would give out). Yeah, there is a very good chance that walking that kilometer while texting is what saved the day. Wow Carl! I have just read through your marathon training and race report. What a journey! You are inspiring me for my third marathon attempt this November. My first was also the Waterfront Marathon. I too remember seeing so many people sitting on the curbs, thinking how unusual to see that after always doing half marathons. 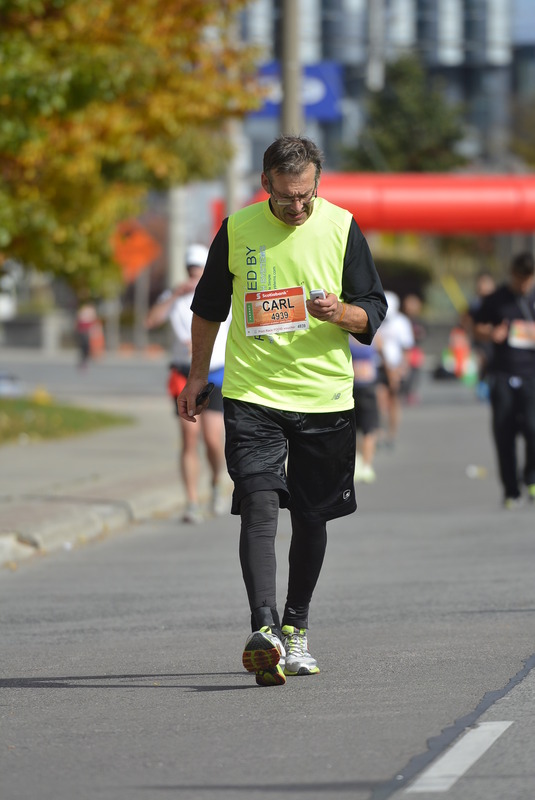 I did enjoy my first marathon experience but my second was miserable – the heat and humidity in Ottawa in May was just something I could not handle and I was nauseous and dizzy from the 8k (!) mark on. Truly a miserable experience, though I did finish. I am looking for redemption this fall! Thanks so much for going back into my “blog archives”. It really means a lot. And thank you for sharing so honestly about your experiences in Ottawa. Here is hoping that your 3rd marathon will a HUGE success. Sometimes those humbling experiences of an “off race”, make our better races SO much sweeter. 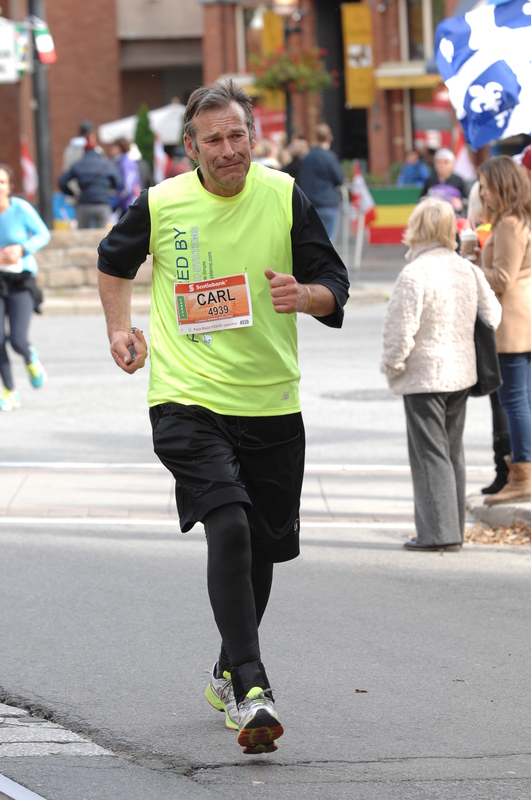 Don’t let my Ottawa experience turn you off taking part in the future – it is a phenomenal race, very scenic, huge crowds (more than Toronto Waterfront), a fantastic expo and there is an incredible energy in the city. For me, just because of temperatures, I will stick to the half marathon, which I have now done there several times, as well as the 5k with my family. Love ATB, I did it in 2014. I skipped it this year because I did the Prague Half Marathon instead. I know, tough choice, Prague or Hamilton, LOL. Wow, sooooo cool. Prague, that would be so amazing to do such a destination race. I think you have talked me into Ottawa…..LOL. I have heard somewhere, the crowds are larger than at STWM, which is quite amazing, when considering the smaller population centre that Ottawa is. Absolutely inspirational! What a beautiful marathon experience. I enjoyed reading this again! Your posts always make me want to go out there and take off running.